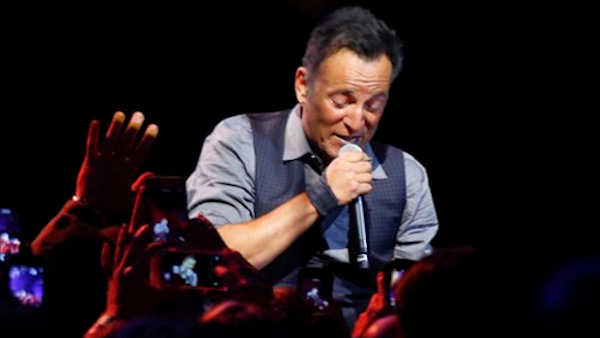 GREENSBORO -- Bruce Springsteen and the E Street Band canceled their North Carolina concert because of the state's new law blocking anti-discrimination rules for the LGBT community, said guitarist Steven Van Zandt, calling it the kind of legislation that's like an "evil virus" spreading around the U.S.
Springsteen and the band considered, but ultimately rejected, other options, said Van Zandt, who posthumously inducted songwriter Bert Berns into the Rock and Roll Hall of Fame at Brooklyn's Barclays Center on Friday. "We always try to find middle ground, and we considered it," he said. "Should we go there and make a statement from the stage? You consider those things, and then you realize that's just playing into their hands. That's not going to hurt enough - you need to hurt them economically." In a statement on his website Friday, Springsteen said North Carolina's law "is an attempt by people who cannot stand the progress our country has made in recognizing the human rights of all of our citizens to overturn that progress." In North Carolina, religious leaders and others have defended the law, saying it protects women and children from men who use the law as a pretense to enter the wrong restroom. But more than 130 corporate executives have signed a letter demanding North Carolina's Republican governor seek the law's repeal, and many states and cities have barred nonessential taxpayer-funded travel there. Van Zandt said he considers it anti-American to discriminate against people. "Whether it's women, whether it's gay, transgender, there's no difference," he said. "It was very important to us to take a stand early in this before it starts to spread all over the place."